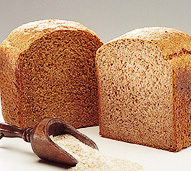 Select the WHOLE WHEAT BAKE program. Whole wheat flour 14 3/4 oz. (3 C) 18 1/4 oz. (3 11/16C) 21 3/16 oz. (1 1/4 C) 12 1/4 fl.oz. (1 1/2 C) 14 fl.oz. Measure and add the ingredients. Select the WHOLE WHEAT BAKE mode and press the Start/Stop button.